Homeopathic treatment was very successful in the Spanish Flu (“Purple Death”). The Spanish Influenza in 1918 was the most devastating influenza pandemic ever and was also called the Purple Death. It took place at the end of the First World War in 1918. The war itself took 9 million deaths. As if this was not enough, the Spanish Flu took a death toll of more than 50 million people all over the world according to modern estimations (*1). It swept across the planet in three waves like a huge tsunami, more deadly than anything known before and comparable to the Black Death of 1348. The second and hardest wave hit during autumn/winter 1918. This was a time when America still had many of the best homeopaths, although the decline had already set in. Boger, Boericke, Dewey and the young Grimmer were among them. So a high standard of homeopathic treatment of this dreaded pandemic was faithfully recorded there. In a meta study, more than 26,000 homeopathic patients were compared with 24,000 patients of the “old school” showing an awesome superiority of the homeopathic treatment. The homeopathic doctors had a consistent mortality rate of 1-3% among their patients, whereas the old school had a death toll of 25-30% of their patients. The homeopathic remedies most frequently used were gels, bry, arn, eup-per and ars. It is to be noted that a very important factor of the homeopathic treatment was the discarding of aspirin, which was standard therapy of the old school. There are some comparative figures of allopathic hospitals suggesting that the avoidance of aspirin alone could have saved millions of lives. High doses of aspirin alleviated pain and fever, but treacherously increased the hemorrhagic tendency of the respiratory tract and thus speeding up the deadly course of the disease. A revealing figure comes from Dr. Pearson of Philadelphia: “The mortality rate in a camp was 25.8%. The lieutenant in charge was persuaded to discontinue aspirin, digitalis and quinine and the mortality dropped speedily to 15% with no medicine what-so-ever. This was in one ward, whereupon it was ordered in other wards and the mortality dropped to 15% with no medicine (*2).” This suggests that the natural death toll of the dreaded disease (lethality) would have been 15% of all infected patients, which is about the same figure one gets by calculation of official census figures (*3). Success of homeopathic treatment (only 1-3% of patients died) is usually compared to 25-30% dying under regular treatment, but actually it should be measured against these 15% as a natural comparator without the specific harmful side-effects of aspirin. Even then, to achieve a mortality rate of about 2% is very convincing and cannot be explained away by “placebo” effects. According to personal information by Armin Sei, W.A. Dewey published an even more impressive survey in the 1921 "Journal of the American Institute of Homoeopathy". It is a meta-analysis of 5 contemporary expertises about the homeopathic treatment during the pandemic. It surveys 61,060 influenza patients treated with homeopathy during the years 1918 to 1919, of which 427 died (mortality: 0,7%). W.A. Pearson, dean of Homoeopathic Medical College in Philadelphia, collected 26,795 cases treated by 88 doctors. He estimated a 30% average mortality of patients treated by the "old school". Spanish Flu. Courtesy: Yoshihiro Kawaoka, University of Wisconsin-Madison. Using genes resurrected from the 1918 Spanish influenza virus, the virus responsible for a pandemic that killed an estimated 20 million people, scientists have gathered important new clues to why the virus spread quickly and killed efficiently. 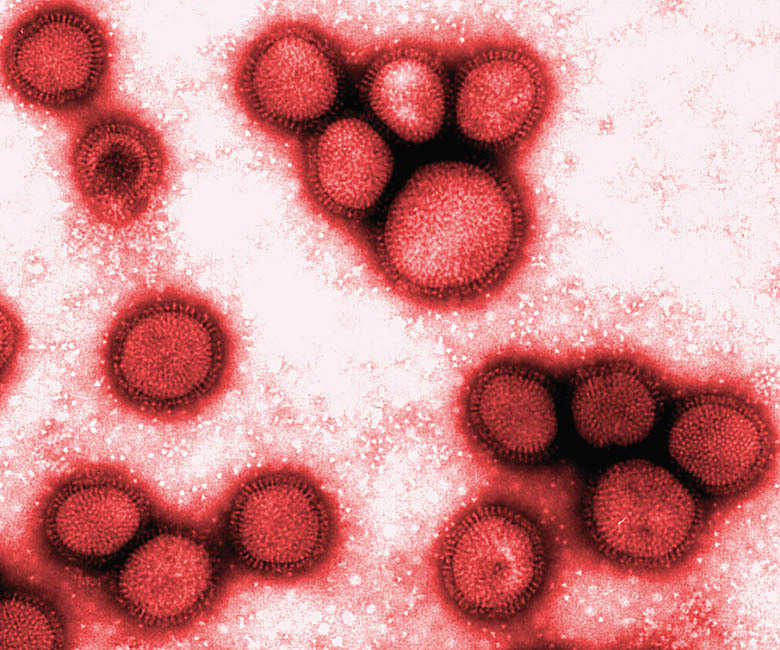 Adding the genes to a comparatively benign strain of influenza (pictured), shows that a minor genetic change can turn a mild form of the virus into a highly virulent strain. The characteristic of the pandemic was the deathly intensity of the disease. Most deaths occurred within the first few days after infection. Some fell sick in the morning and were dead in the evening. The onset was so sudden that it overwhelmed the victims and incapacitated especially the young and vigorous in a few hours. Death followed by fulminant development of hemorrhagic pneumonia (“most vicious type of pneumonia ever seen”) and lung oe. Purple cyanosis was a sure sign of imminent death. This was accompanied by irregular heartbeat, tightness in chest, rapid and deep breathing, a kind of “air hunger”, struggling to get air and to breathe with flapping dilated nostrils. Breathing became gradually slower and gasping until death came with blood-tinged sputum from mouth and nostrils. Young adults were hit hardest, perhaps especially those with the strongest immune response as was shown by recent research (see next paragraph). In Connecticut 56% of deaths were 20-40 years old, only 9% were over 40 years. This fact is in strong contrast to other influenza epidemics, where mostly the old and weak people die. The ominous sign of a deathly course was a peculiar kind of cyanosis. That is why the pandemic was also called the “purple death”; mahogany spots over cheek bones, face and lips turn cyanotic, purple-grayish, ashen, the spots may then cover the whole body; the ominous colour was referred to be like heliotrope, a brilliant shade of purple, magenta, signalling cyanosis and need of oxygen in blood – once this colour appeared in a patient he was practically sure to die. “If they begin to look like a huckleberry (blueberry) they are sure to die”. The Lancet published a then rare colour illustration demonstrating the heliotrope characteristic of the disease in 1918. Post-mortem: In autopsies were found blue swollen lungs with wet foamy surfaces; lungs filled with enormous quantities of thin bloody fluid which would gush out when sectioned for examination. Large parts of the lungs were airless. Abdominal vessels maximally engorged and sometimes ruptured. Brain oetous with small haemorrhages. The symptoms during the course of the disease were the typical signs of influenza, such as high fever and aching pains all over, especially in the back. Some further symptoms frequently described by homeopaths: tongue dry, brown, trembling – incontinence of urine and stool – delirium, violent – stupor, semi-conscious – picks at bedclothes – says is well though very sick – ptosis of both eyes – and a strange odour which was frequently described as reminding of dead bodies on a battlefield; it vanished soon after the person had died. Why was the Spanish Flu so deadly? The viral nature of the pandemic was only confirmed of late. Leading virologists are convinced that it was a variation of the bird flu virus A/H1N1. DNA sequencing even revealed its genetic code. Researchers dug out the corpse of a Alascan inuit woman who had died from the Spanish Flu in 1918, which was conserved in the permafrost. They identified the virus as a H1N1 type and presented the complete sequence of the H-gene in 1990. Recently, in 2006, they even reconstructed this dreadful virus under high-security lab conditions (*5). In a way they woke up the old devil again, and it proved as deadly as in 1918. All infected mice died in a few days with a characteristic lung engorgement and immunological hyperreaction. To confirm its possible lethal effect on the human immune system, they repeated the same experiment with macaca monkeys, quite close to humans. The same fatal hyperreaction in the form of a cytokine storm took place and destroyed their lungs. So most likely the virus killed by triggering a violent cytokine storm (*6). c) An immunological hyper-reaction called a cytokine storm (*7), which is uncommon in other virus pandemics; this was discovered only lately. The high lethality of perhaps 15% - in other influenza pandemics it is less than 0.1% - was most likely due to this cytokine storm. The exaggerated immune response makes this influenza so different from other influenzas. d) The historical context at the end of WW1; the nations were in a battered state, old beliefs shaken or destroyed, survivors all worn out from war. The state of the earth was like after a huge convulsion, like a patient after a grand mal epileptic fit. Some may say that this is the major condition for such a huge calamity to arise rather than blaming it on a virus alone. Trench-fight and static warfare were the characteristics of WW1 and may be compared to the immunological hyperreaction against the virus: the armies of the immune system pitted against the virus, a storm of cytokines released like heavy artillery, both sides suffering enormous loss, but no ground is gained. *3. http://en.wikipedia.org/wiki/Spanish_flu; population of USA was about 14 millions, 30% suffered, up to 675000 died. *4. This is one of the reasons why health authorities are so afraid of the new bird flu virus H5N1, which may take the same development and trigger an even more deadly new pandemic. *6. This gave rise to the idea that former vaccinations were responsible for this hyperreaction, but then the monkeys should not have died. Also the high death toll of 7 million Indians would be improbable, because in India vaccination was not as common as in Europe in the early 20th century. This makes the vaccination theory improbable.